We brought you the news before the SIHH 2019 about the new MB&F Horological Machine No. 6 Space Pirate Final Edition but there’s no real feature unless it’s accompanied by some of our live macro pictures. Therefore, here we go again. Originally released at the end of 2014, the Horological Machine No.6 —HM6 Space Pirate— came out with an announcement that MB&F would manufacture only 100 movements in total for this watch. The HM6 was first launched in titanium in a limited edition of 50 pieces, followed by 18 pieces in rose gold and then two 10-piece SV/Sapphire Vision editions, one in platinum and the other in rose gold. In 2017, four unique pieces were presented as the ‘Alien Nation’ crafted entirely in sapphire crystal, each with its crew of miniature aliens. Today, the HM6 Final Edition comes in a highly exclusive 8-piece limited edition in stainless steel. The new MB&F HM6 Final Edition is not only case in stainless steel but it also features polished grooves running along the case, accentuating its curves. Dark blue hour and minute spheres match the blue winding rotor. And finally, a more generous central dome, allowing an even better panoramic view of the flying tourbillon. With its 475-component movement, developed entirely from scratch, with revolving hour and minute spheres driven by conical gears and a platinum winding rotor regulated by twin aluminum turbines, the flying 60-second tourbillon under its sapphire crystal dome with retractable shield is the cherry on top of the cake. The back remains the same as on the original HM6 Space Pirate but the blue conical gears add the perfect amount of contrast to the stainless steel case. Available in a final limited edition of only 8 pieces in stainless steel, the watch will sell at a slightly lower price than that on the first and original HM6 Space Pirate. A stunner that we can’t wait to see in person and bring you live pictures as we report live from Geneva, Switzerland next week at the SIHH 2019. Sticker Price $215,000 USD. 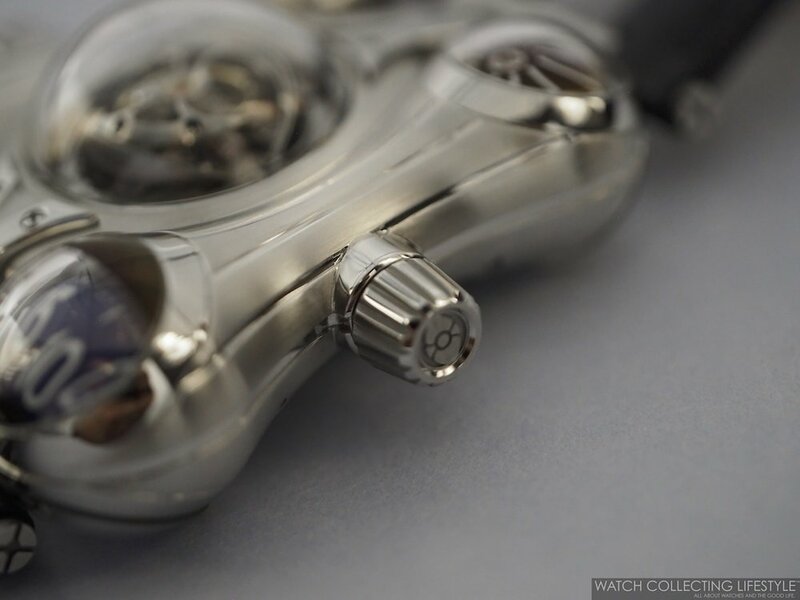 For more info on MB&F click here. Posted on January 29, 2019 by Editor & Publisher and filed under MB&F, SIHH 2019, SIHH and tagged MB&F Horological Machine No. 6 Space Pirate Final Edition MB&F SIHH SIHH 2019 MB&F HM6 MB&F HM6 Alien Nation Independent Brands 2019 Horological Machine.